Mast Cells. 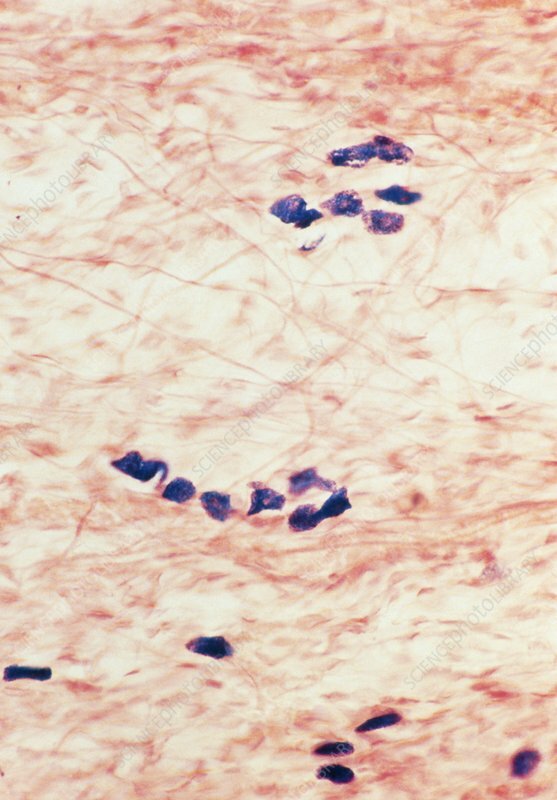 Light micrograph of a section through human connective tissue showing mast cells. The mast cells are seen as blue-stained granular structures. The pink is the connective tissue fibres. Pale nuclei are visible in several of the mast cells (at upper right). Mast cells are associated with blood vessels in the connective tissue between organs. Their function is poorly understood but they are associated with the immune response. Mast cells have been shown to contain heparin, a potent blood anti-coagulant, and histamine, one of the chemical mediators of inflammation. Magnification: x100 at 35mm size.